Cybergun M249 Para (Dark Earth). Cybergun M249 Para (Dark Eearth). 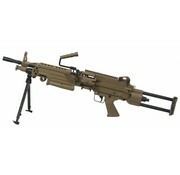 Cyberguns M249 features the fully licensed form and markings making it very realistic. They have followed the same design and layout as the A&K / G&P school of M249 making it nice and hefty with a steel body, Aluminium accents and polymer foreguard. The built-in bipod stays out fo the way while not in use but drops out when needed making it a welcome addition to a weapon some might find too heavy. The collapsible stock and short barrel let it shrink down to about 79cm to make it easier to move around in tighter quarters as well as packing in shorter bags. As an M249 should be, it fires on full auto only.